Initiating a Group Discussion is a high profit-high loss strategy. When you initiate a Group Discussion, you not only grab the opportunity to speak, you also grab the attention of the examiner and your fellow candidates. If you can make a favourable first impression with your content and communication skills after you initiate a Group Discussion, it will help you sail through the discussion. But if you initiate a Group Discussion and stammer/ stutter/ quote wrong facts and figures, the damage might be irreparable. If you initiate a Group Discussion impeccably but don't speak much after that, it gives the impression that you started the Group Discussion for the sake of starting it or getting those initial kitty of points earmarked for an initiator! When you start a Group Discussion, you are responsible for putting it into the right perspective or framework. So initiate one only if you have in-depth knowledge about the topic at hand. Quotes are an effective way of initiating a Group Discussion. If the topic of a Group Discussion is: Should the Censor Board be abolished?, you could start with a quote like, 'Hidden apples are always sweet'. Start a Group Discussion by defining the topic or an important term in the topic. For example, if the topic of the Group Discussion is Advertising is a Diplomatic Way of Telling a Lie, why not start the Group Discussion by defining advertising as, 'Any paid form of non-personal presentation and promotion of ideas, goods or services through mass media like newspapers, magazines, television or radio by an identified sponsor'? For a topic like The Malthusian Economic Prophecy is no longer relevant, you could start by explaining the definition of the Malthusian Economic Prophecy. Asking a question is an impactful way of starting a Group Discussion. 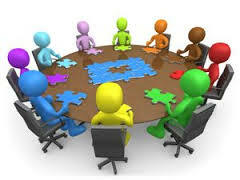 It does not signify asking a question to any of the candidates in a Group Discussion so as to hamper the flow. It implies asking a question, and answering it yourself. Any question that might hamper the flow of a Group Discussion or insult a participant or play devil's advocate must be discouraged. Questions that promote a flow of ideas are always appreciated. Initiating a Group Discussion with a shocking statement is the best way to grab immediate attention and put forth your point. If you decide to initiate your Group Discussion with facts, figure and statistics, make sure to quote them accurately. Approximation is allowed in macro level figures, but micro level figures need to be correct and accurate. For example, you can say, approximately 70 per cent of the Indian population stays in rural areas (macro figures, approximation allowed). But you cannot say 30 states of India instead of 28 (micro figures, no approximations). Stating wrong facts works to your disadvantage. For a Group Discussion topic like, China, a Rising Tiger, you could start with, 'In 1983, when China was still in its initial stages of reform and opening up, China's real use of Foreign Direct Investment only stood at $636 million. China actually utilised $60 billion of FDI in 2004, which is almost 100 times that of its 1983 statistics." Use a short story in a Group Discussion topic like, Attitude is Everything. Use a general statement to put the Group Discussion in proper perspective. Most Group Discussions do not really have conclusions. A conclusion is where the whole group decides in favour or against the topic. But every Group Discussion is summarised. You can summarise what the group has discussed in the Group Discussion in a nutshell. · Avoid raising new points. · Avoid stating only your viewpoint. · Avoid dwelling only on one aspect of the Group Discussion. Keep it brief and concise. It must incorporate all the important points that came out during the Group Discussion. If the examiner asks you to summarise a Group Discussion, it means the Group Discussion has come to an end. Do not add anything once the Group Discussion has been summarised. 1. always be the initiator and concluder of the Group Discussion then being a participant. 2. But if you are particaipant always try to be the most vianl/key participant. 3. put points firmly and always try to get others support too. 4. if you find that the discussion os going offttrack then never loose an oppurtunity to bring it back to straem this is the best point to score max. 5. try to keep latest information on the topic . 6. be very polite , people may try to provoke you to to get more points but try to keep cool. 7. most important don't wait for your turn to speak when discussion is on. inturrupt politely if you want to put forward your points. 8. last but not the least keep atab on the time given for discussion. score points by wrapping up the discussion if you feel that the discussion is heating but the time is going to be over. 9. during clonclusion, do end with the conclusion note. that shows your leadership quality. 4. Your capability to keep your cool and listen as well as putting your points. Group Discussion basically means searching your team player, leadership, communication capability. 1. Adequate matter/ Subject matter is essential: You should have subject knowledge and be well aware of the latest happenings around you, not just in India but around the world as well. To be in a better position, make sure that you have in-depth knowledge on the subject. Subject knowledge is a pre-requisite while you are preparing for a group discussion because you will then have the power to steer the conversation to whichever direction you want to. If you can memorize some relevant data, it will be an added advantage. 2. Make Sure you Read Widely: Being an avid reader will help you in group discussions. Last minute preparations you are strictly a no no, while you are preparing for group discussions. You should read over a period of time. Reading not only adds to your knowledge database, but enhances your vocabulary skills as well. Plus reading over a period of time, helps in your understanding of a particular subject/ topic better. 3. Choose Magazines that are Rich in Content: Always opt for magazines that are content rich and not just full of advertisements. Often magazines have columns which are promoting a particular institute etc. Avoid such magazines, do some research and buy the best that will be beneficial for you in the long run. 4. Be Aware of Topics that are Repeated: Often, there are topics which re-appear with minute changes and minor variations. Be aware of such topics well in advance so that you have ample time to prepare for the same. For example the issues of terrorism, gender inequality, poverty, Ayodhya conflict, liberalization and privatization, reservations in educational institutions etc often appear as GD topics. Make sure you know these topics well and can come up with some unique, insightful points along with dates, stating facts. 5. Work on your Communication Skills: You should be well versed in your communication skills. You should have a good vocabulary and a decent command over English. Much before your actual group discussion, rehearse well. You can sit with a group of friends and choose a topic and indulge in a friendly banter. Not only will this increase your knowledge, you will be a better speaker by the time it is time for your GD. 6. Listen to the Topic Given During GD Carefully: Listen to the topic carefully and understand it... Be alert and vigilant. Sometimes, the topic may be really simple but the manner in which it is presented to you, can be baffling. The first thing that you should do after hearing the topic is by structuring it on the sheet that is given to you to make notes. Make a rough sketch of the points that you would like to speak aloud. You will be at an advantage if you open the discussion, but then beware of what you speak. Deviating from the main topic, or passing strong statements like ‘I agree/ or disagree …’ should be avoided. Your strategy should be to test the waters and make a generic statement relevant to the topic. If you can, back it up by relevant data. 7. Try and Maintain a Balance in your Tone: Besides what you are saying, remember that the panelists are observing your body language as well. If you do not agree with the other student’s point of view, do not raise your tone in objection. Listen to his point of view and instead of dismissing it upfront, try and draw a common ground. .
8. Listening Skills are Essential: Carefully listen to what others have to say. Just speaking throughout the discussion doesn’t make you smart, you should also give others a chance to speak. Try and listen to him/her, respect their view point too. If the speaker is making an eye-contact with you remember to acknowledge him by saying “yes, you agree” or just by nodding your head, so that the speaker is aware that his listeners are listening to him and paying full attention. This will also show that you are vigilant and are an active participant in the discussion. 9. Body Gestures are very Important: The panelists observe the way you sit and react in the course of the discussion. . Body gestures are very important, because your body language says a lot about you.In a GD, sit straight, avoid leaning back on to the chair or knocking the table with pen or your fingers. Also, do not get distracted easily. For example, if the door in room you are sitting in opens, do not look back to see who it is , this will show how distracted you are. 10. Be the first and also the Last to Speak: As mentioned earlier, initiating a GD is an advantage. Closing it too also adds brownie points. If you can grab the opportunity to close the discussion, then you should summarize it. If the group has not reached a conclusion try concluding it. Avoid stating only your viewpoint. Avoid dwelling only on one aspect of the GD. It must incorporate all the important points that came out during the GD. If the examiner asks you to summaries a GD, it means the GD has come to an end. Do not add anything once the GD has been summarized. Download this tutorial in PDF. It helps us to do better.